Srikakulam Dist, District Selection Committee Backlog Posts Recruitment, Last date to apply is 29.09.2018. 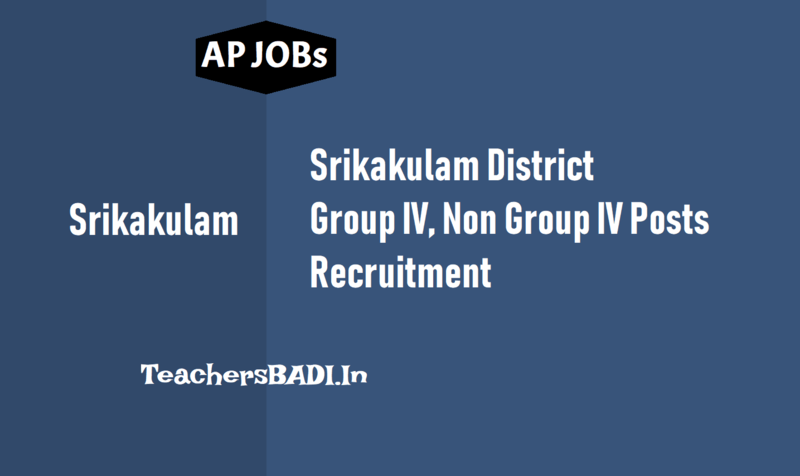 Srikakulam Dist, District Selection Committee’s limited recruitment in subordinate Offices for Scheduled Caste/ Scheduled Tribe Backlog Vacancies. 1) Selection of candidates will be made on the basis of percentage of marks obtained in the qualifying academic examinations i.e., as indicated against the posts as above, besides taking into consideration of preferences applicable if any. 2) The rule of reservation will be applicable as per Govt. norms as per Roster register of respective departments. 3) Separate applications shall be filed for each post and one application for 2 or more posts shall not be entertained and such applications shall summarily be rejected. 4) Applications without enclosing the required Educational Qualification Certificates/Caste Certificates will summarily be rejected. 6) The District Selection Committee is having the power to alter/change the number of vacancies as per the availability and with regard to the Selection of Candidate; the decision of the DSC shall be final. 7) Applications received after the time stipulated below will not be entertained. 10) The above posts are confined to purely local candidates only.